Trust is frequently a requirement for economic exchanges and the management of natural resources. Providing public informaiton on past actions can promote trust through the formation of reputations. 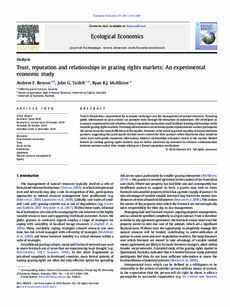 We developed an economic experiment to test whether a formal reputation mechanism could facilitate trusting relationships in the tradeable grazing rights markets. Providing informaiton to create formal public reputations for market participants did not increase the overall efficiency of the market. However, it did result in greater equality of income between partners, suggesting the participants showed more concern for their partners when they knew they would be rated. Even with public reputation informaiton, bilateral relationships remained central to the market. Market failures in exisitng grazing rights markets may be better addressed by measures to increase communication between partners rather than simply relying on a formal reputation mechanism.